Davis Law Group, P.S., has filed a civil lawsuit on behalf of a woman who was the victim of a vicious dog attack in Grant County, Washington. In 2016, while on vacation near the city of Quincy, the victim was visiting the home of a friend when the friend’s dog unexpectedly and without warning or provocation lunged at and viciously bit her on the face. The dog was a 14-year-old American Eskimo breed that was partially blind and deaf. The lawsuit claims that the defendant dog owners had prior knowledge that their dog had vicious and/or dangerous propensities that were likely to lead to the injuries inflicted upon another human being but failed to properly restrain the dog. The victim is an attractive 49-year old married mother and senior manager at Microsoft who enjoys spending time with her friends and family. She was taken to a local emergency room for treatment of a large, jagged laceration across the mid to left upper lip that went deep into the facial muscles. 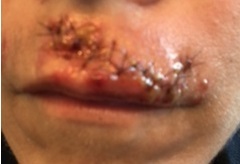 She required 16 stitches to close the wound. Although she has had multiple plastic surgery scar revision procedures, the victim will have a noticeable scar on her face for the rest of her life. The victim's claim for damages include medical bills, lost wages, pain and suffering, emotional injury, and other harms and losses. Plaintiff: Un-named to protect privacy of the victim.